The Institute of Electrical and Electronics Engineers (IEEE) has elevated alumnus Xiaobo Tan (EE Ph.D. 2002) to the rank of Fellow. 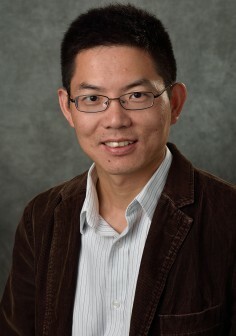 His citation reads, “for contributions to modeling and control of smart materials and underwater robots.” Tan is a Foundation Professor in the Department of Electrical and Computer Engineering at Michigan State University. At Maryland, Tan was advised by Professor John Baras (ECE/ISR) and Professor P. S. Krishnaprasad (ECE/ISR). Tan’s research interests are in electroactive polymer sensors and actuators, modeling and control of smart materials, modeling and control of systems with hysteresis, and fish-like underwater robots and their application to environmental sensing. He is the director of MSU’s Smart Microsystems Laboratory. His research has been supported by NSF, ONR, USGS, the Great Lakes Fishery Commission, and several other agencies and organizations. He received the NSF CAREER Award in 2006 and the MSU Teacher-Scholar Award in 2010. He has received several Best Paper Awards, including the 2008 ASME DSCD Best Mechatronics Paper Award, the Best Paper Award in Behavior and Intelligence at Alife XIII Conference in 2012, the Best Paper Award (Application category) at the ASME Dynamic Systems and Control Conference in 2013, and the Best Paper Award of Symposium 3 at the ASME Conference on Smart Materials, Adaptive Structures and Intelligent Systems (SMASIS) in 2014. Tan integrates his research with educational and outreach activities, including directing an NSF-funded Research Experiences for Teachers (RET) Site program at Michigan State from 2009–2016 and curating a robotic fish exhibit at the Michigan State Museum in 2016.